The GNSC provides funding for established Neighbourhood Groups as well as new Neighbourhood Groups that are interested in starting up. See the image below to see where you and your group fit within the funding process. If you are interested interested in starting a new NG please visit this page for more information. 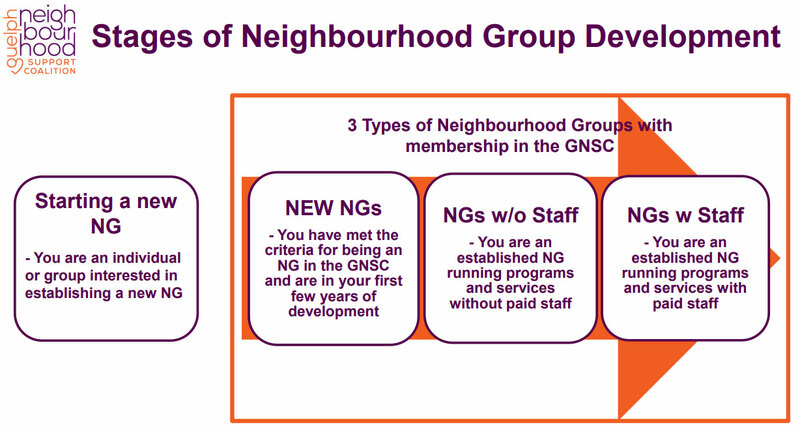 When you are ready to submit an application to become a new NG, download the Neighbourhood Group Start Up Application and email it to admin@guelphneighbourhoods.org. Please read this document before you start the application process. This has important information including Key Dates and a Checklist. If you have more questions or concerns about funding through the GNSC, please get in touch.